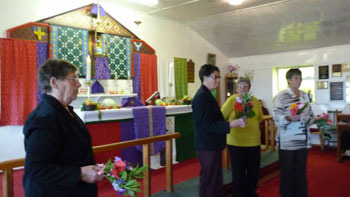 and conducted by Lay Minister Anne Green and assisted by Lay Minister Dereck Rogers. 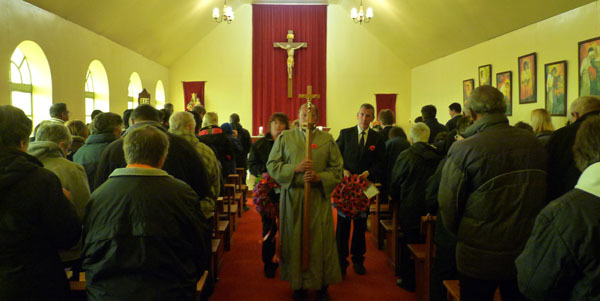 Afterwards the congregation processed to the flagpole outside the Prince Philip Hall where wreaths were laid and a one minute's silence observed to commemorate those lost in the service of the United Kingdom.The service is always inter-denominational and brings together Anglicans and Roman Catholic congregations and those of other faiths in a joint service. 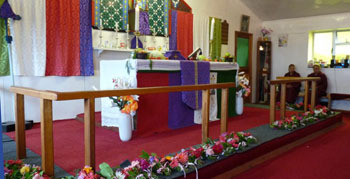 In turn the Anglican St Mary's Church will host the service in alternate years. 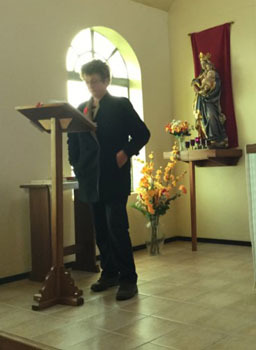 delivering one of the readings. 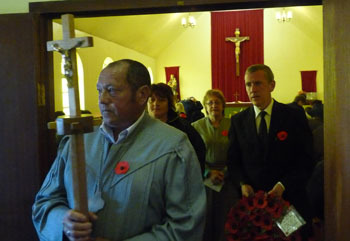 At the Tristan flagpole are gathered, left to right, Lay Ministers Anne Green and Dereck Rogers, Acting Chief Islander Lorraine Repetto and Administrator Alex Mitham. 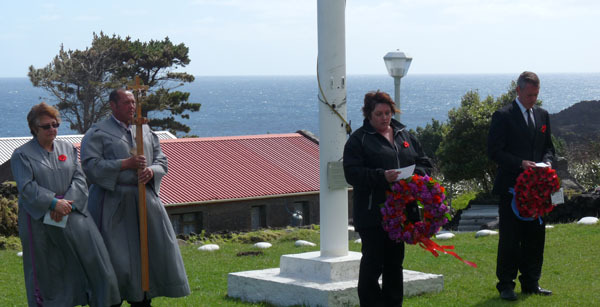 both of which were laid on the steps of the flagpole during the ceremony. 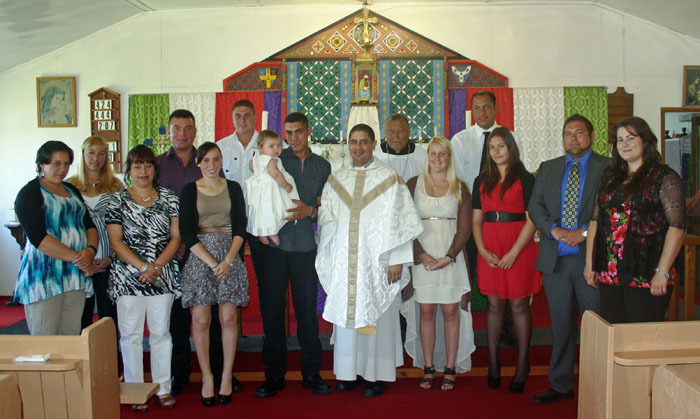 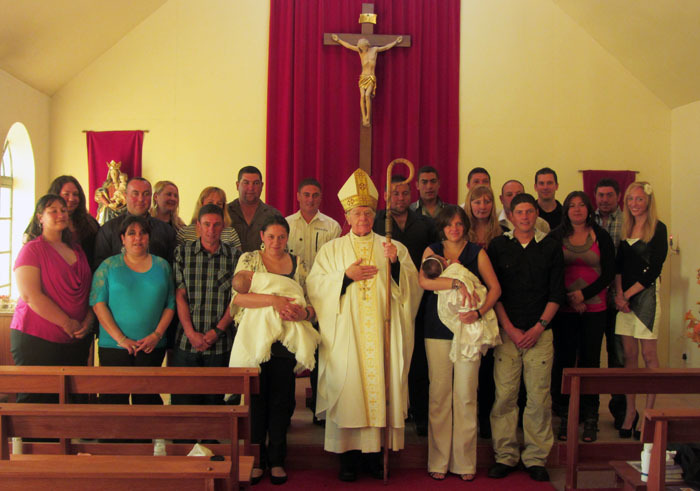 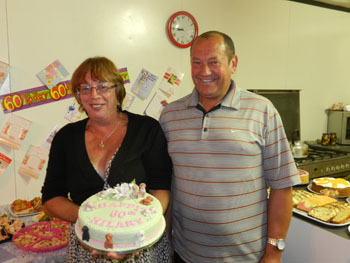 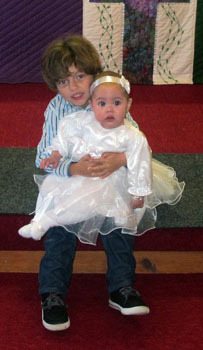 Liam and Amelia Leitner were christened on 13th September 2015 at St Mary's Church, Tristan da Cunha. 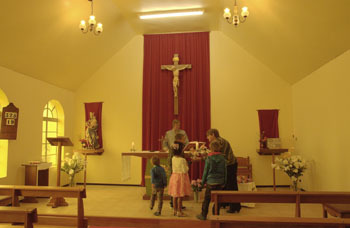 Tristan's Veterinary Officer Dereck Rogers was awarded a British Empire Medal in the Birthday Honours List announced on 13th June 2015.
at the altar with Lay Reader Carlene Glass-Green and girl servers right. 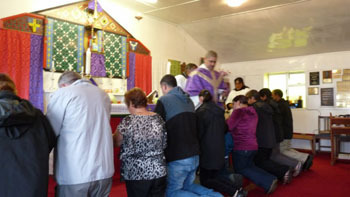 Below: Members of the congregation receive Holy Communion from Rev Denzall Snell. 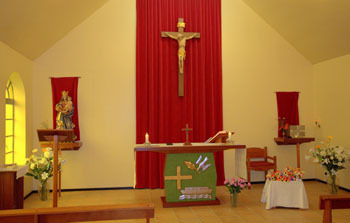 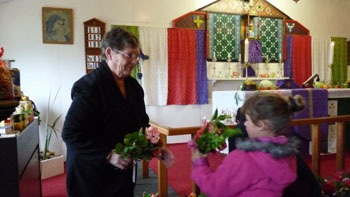 For the past few years, St Joseph's Roman Catholic Church have been celebrating Harvest Festival and Mothering Sunday on the same Sunday the same as the Anglican Church. 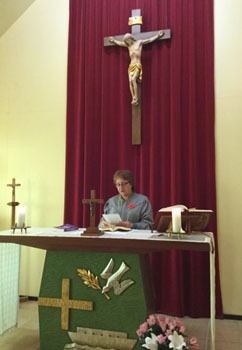 However, given how important both events are this year, the Catholics decided to celebrated Harvest Festival on Sunday 8th March and Mothering Sunday the following week on Sunday 15th March. 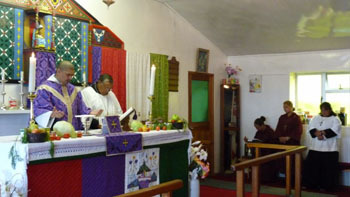 All harvest goods received were combined with those from the Anglican Church and distributed as one collection. 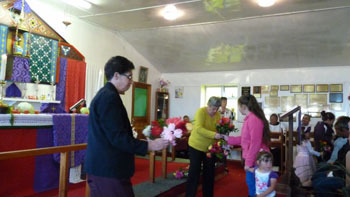 Right: Children Kieran Glass, Connor Glass, Calvin Green and Deanna Rogers collecting flowers from Anne Green for their mothers and all women who came to the Mothers day service at St Joseph Catholic Church, Whilst Eucharistic Minister James Glass looks on. 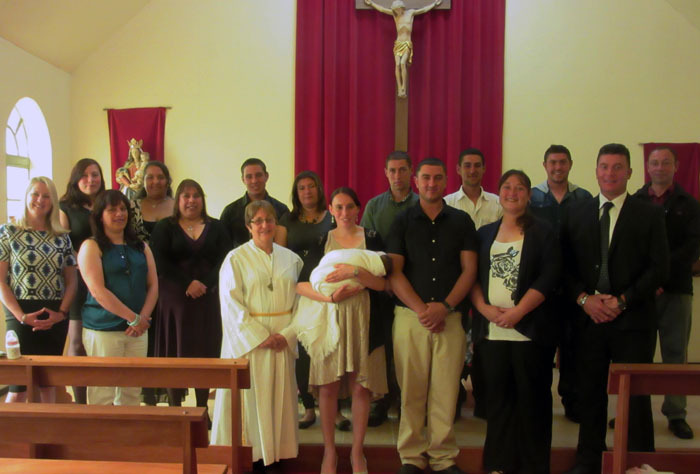 Savanna Rose Burns Green was christened on 1st February 2015 at St Mary's Church, Tristan da Cunha.